Inflatable Bungee Ride – Fun First, Safety Second | OhGizmo! Thanks to years and years of lawsuits, those of us living in the US or Canada tend to miss out on products that actually look like they’d be quite fun, just because there’s an abnormally high chance you could break your neck with them. 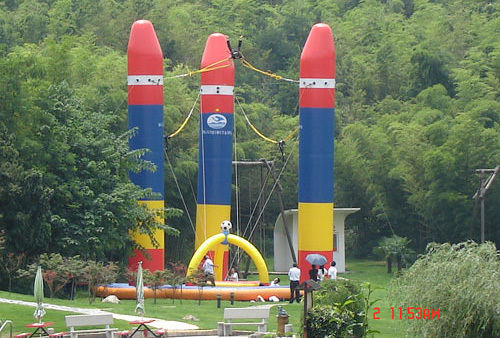 Case in point, this inflatable bungee ride which is manufactured by a handful of different Chinese amusement companies. It features a set of heavy-duty bungee cords which are connected to 3 or 4 inflatable towers. Once you’re strapped into a harness of some sort (I hope) the tension on the bungee cables is increased (most likely by a couple of carnies pulling you towards the ground) until you’re released and launched skyward where you enjoy several seconds of uncontrolled tumbling and spinning until gravity returns you to the Earth. I really have no idea how much a setup like this costs, and even if you were seriously interested, I’m pretty sure you’d have a heck of a time importing one into North America.